The only known cure for celiac disease is a strict, lifelong glutenfree diet. In addition to its extensive use in the food industry, gluten is also a common bonding agent for various products including medications. Owing to the efforts of celiac associations, in May 2017 the Turkish Parliament formed an inquiry committee to investigate the support options for diagnosed celiac patients and the predicted undiagnosed population of approximately 750,000 individuals in Turkey. 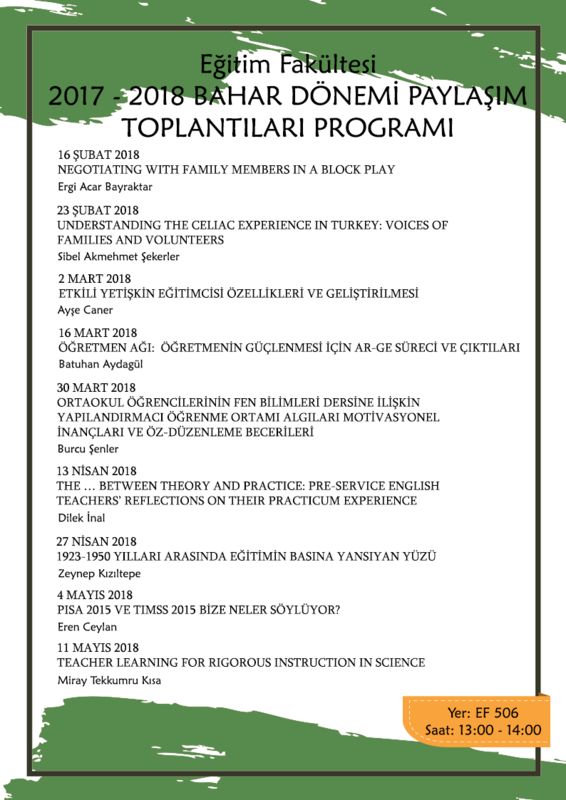 Having been involved in one of the oldest celiac CSOs (Life with Celiac Association) in Turkey, I will first describe my experience in the association as a participant observer and a volunteer. I will then share preliminary findings based mainly on my in-depth interviews with individuals who either themselves have celiac disease or whose families include at least one individual with the disease. Although refraining from gluten is a seemingly simple way to avoid the effects of the disease, the lack of accommodations for such a diet converts it into a disabling condition which threatens the bearer's life quality. This study has vital implications for teachers and counselors who need effective strategies to be able to support students with celiac or similar chronic diseases.